Learn how to make the best all-purpose easy meat sauce! This recipe can be made in the instant pot or on the stove top. You can keep this easy meat sauce in the freezer and use it for stuffed shells, lasagna, or for spaghetti night! I wish you could smell all the brilliant smells wafting from this ultra simple homemade meat sauce. It’s cold outside here, so the windows are fogging up. The skies are grey but inside it smells like the summer sun, shining brightly on a Tuscan tomato field. Gosh, I love the smell of tomatoes and basil together. Taddahhh! Look what we’ve got today. A recipe that pleases both my instant pot friends and my stove top ones too. I specifically designed this easy meat sauce recipe so that everyone would be happy. 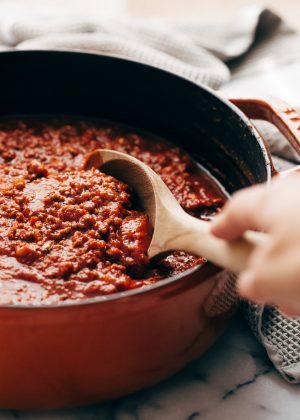 And all though personally, I find the process of making meat sauce on the stove more gratifying, stirring it with a wooden spoon, tasting it every hour to make sure the flavors are coming together nicely, I can certainly see the appeal in having it made three times as fast in the pressure cooker. 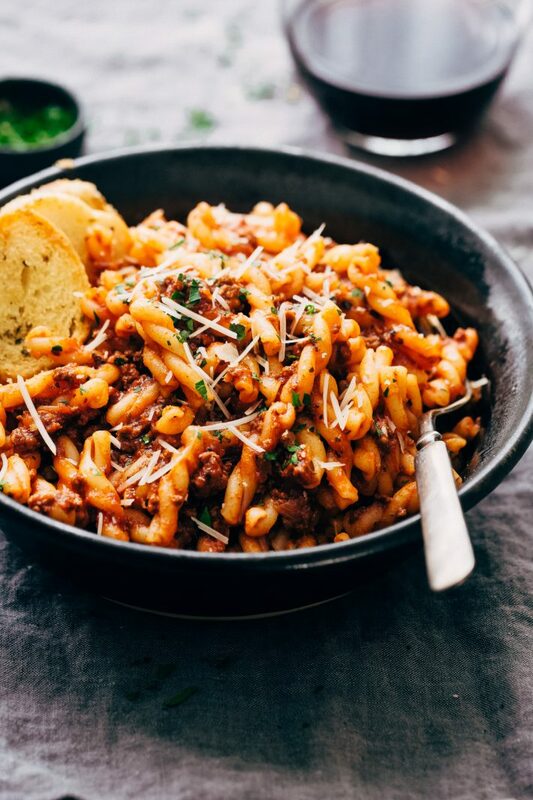 This meat sauce is probably the complete opposite to what you grew up eating. Unless you’re Italian. Because ain’t nobody gonna beat nonna’s recipe. 🤷🏻‍♀️ Not even gonna pretend to. But I do think mine comes pretty darn close. Growing up, spaghetti and meat sauce was a staple in most households because 1.) it’s super easy to throw together 2.) it pleases the kids 3.) it satisfies the hubbies that still eat like kids? Today’s super easy meat sauce is rich, thick, and meaty. One of the things I detest about store-bought meat sauce and a lot of homemade spaghetti sauce recipes is that the ratio for meat and sauce is always a little off. They always contain way more sauce. My version has enough tomato base to coat the spaghetti yet sufficient amounts of meat to satisfy a grown adult. Making meat sauce isn’t difficult. You can always brown some meat and toss in a couple of cans of store-bought tomato sauce and plop in a basket of noodles. But trust me when I say this, it won’t have any of the flavors this version does. All it requires is a little time or an instant pot. 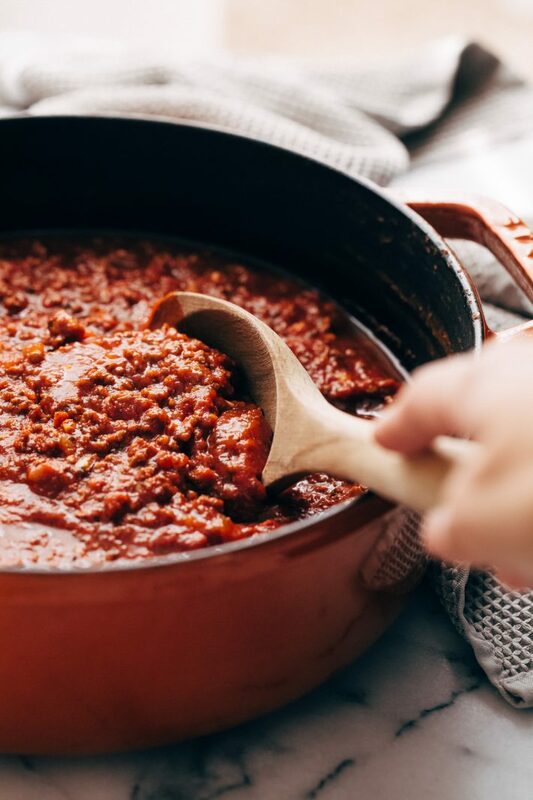 Lace your homemade meat sauce with layers of garlic, onions, herbs and of course, the best kind of canned tomatoes one can find. It’s warm and cozy and the Italian tomatoes make the meat beautifully rich and tender. It’s cozy and it’s the best kind of food there is. 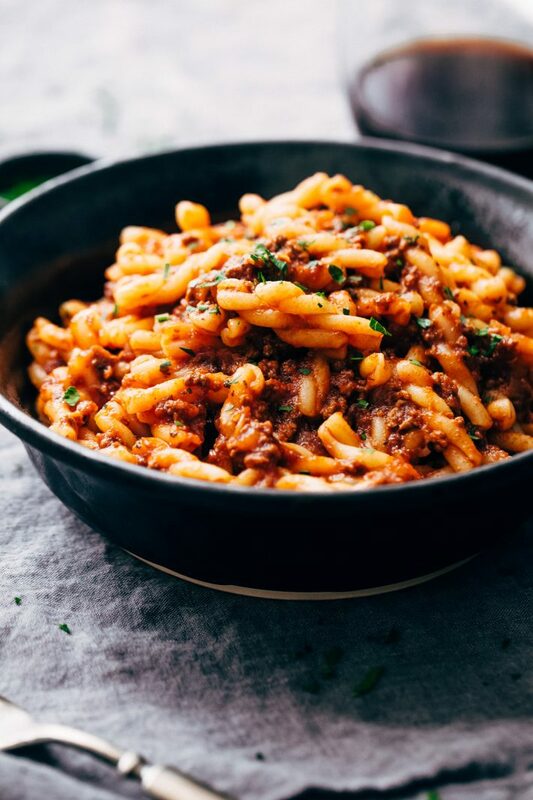 I have to admit; I went through a ton of names before settling on ‘all purpose easy meat sauce.’ Mainly because it’s such a simple recipe to make that it could also be called a ‘back pocket meat sauce.’ Once you make a large batch of this stuff, you’ve got meals you can pop out in a matter of minutes. Trust me, naming recipes is the most fun and the most challenging part of my job. I want to be clear and concise, but I also don’t want it to be boring. I settled on all-purpose + easy because that’s what it is! You can use this sauce in lasagna. It’s thick and hearty and will hold up nicely between the layers. If you’ve had soggy lasagna the way I have before, you’ll understand why the sauce is the key! 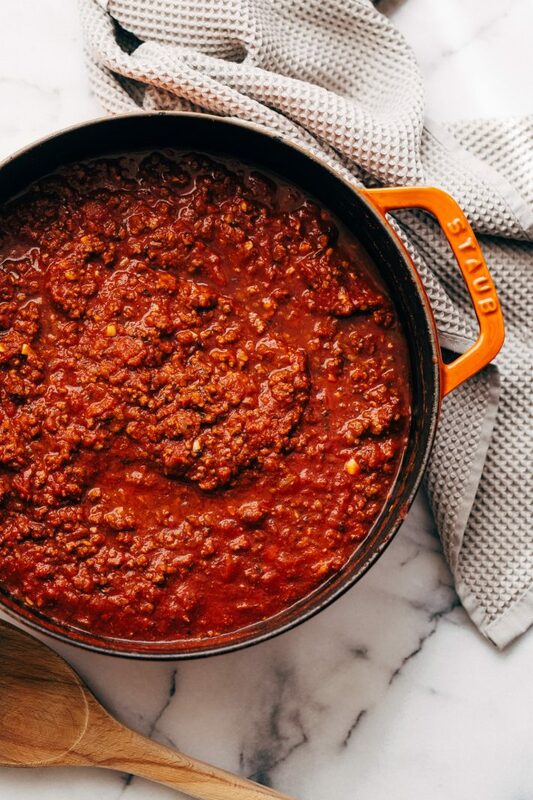 Store-bought meat sauce will leave you in a puddle. You can toss it with spaghetti. You can stuff the sauce in shells and top it with a little cheese and broil it. And if you’re like me right now, doing this low carb thing where you’re seconds from burnout, you can serve it on top of black bean pasta. Trader Joe’s has got it going on with those bb pasta macros! And if pasta isn’t life, there’s always zucchini boats! I speak from experience. I’ve tried both (boats topped with low-fat mozz, obvi) and they’re so satisfying. A nice change of pace from my otherwise grass and protein diet. <– Truth talk. So let’s break this easy meat sauce down. This recipe takes about 5 minute of prep work and about 15 minutes of hands-on time. Other than that, you can cook it quickly in the pressure cooker or leave it for 3- 3 1/2 hours to bubble away on the stovetop. Building the layers in a meat sauce is key. I start with a generous glug of olive oil in a thick bottom pot. Then, I’ll add in 12 whole garlic cloves. Leave them on the lowest setting and let the olive oil infuse with the garlic flavor. It’ll take around 10 minutes, and you just need to stir it now and then so the garlic doesn’t brown. Once you do this, you’re meat, and everything else you add in will have those flavors seared into them. At this point, if you aren’t a fan of garlic in your meat sauce, toss the cloves or keep them for something else. I chop up the garlic and add it back into the sauce later. And although in the recipe you’ll find that infusing the oil is an optional step, I’m going to suggest you do this. It’s the core to more flavor in a homemade meat sauce! The other thing I want to stress about this recipe, use the BEST canned tomatoes you can. I know my local grocery stores always run a special on organic brands every few months. I’m the crazy lady that has her cart full of sauce/ puree/ fire-roasted/ crushed/ diced/ whole tomatoes when this sale hits. You always want to use good quality Italian plum tomatoes when you’re making a tomato-based recipe. Finding tomato puree made from San Marzano tomatoes can be difficult. So if your grocery store carries them whole, just pop it all into a large bowl and use your hands to break them down. I assure you, it’s oddly satisfying! And just look at that sauce! It makes a ton! If you do large family gatherings where you’re making lasagna, this will comfortably feed a crowd! I like to pop the meat sauce into zip-top bags and store it in the freezer. That way, you don’t have to worry about making it when you want lasagna or when you’re putting together weeknight dinners. But also, this sauce tastes better as it sits. So if you’re making lasagna, say on Saturday, make this sauce on Thursday or Friday. 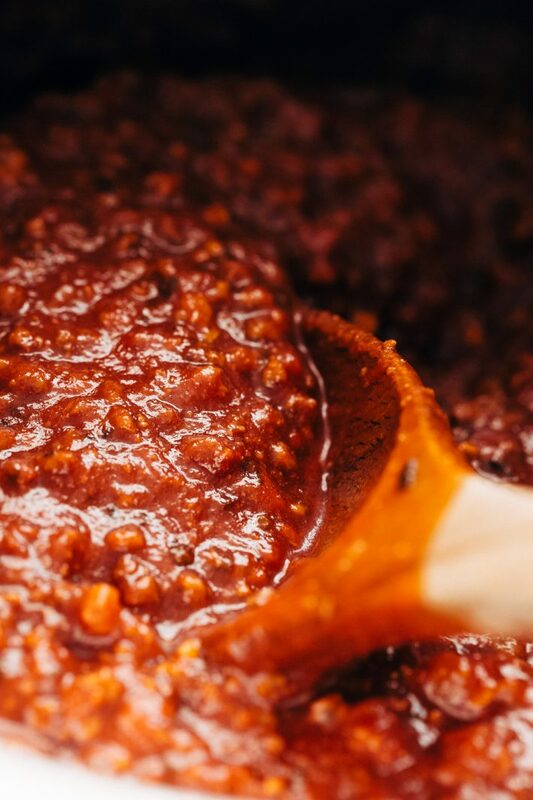 Hanging out in the refrigerator makes this sauce that much more delicious. 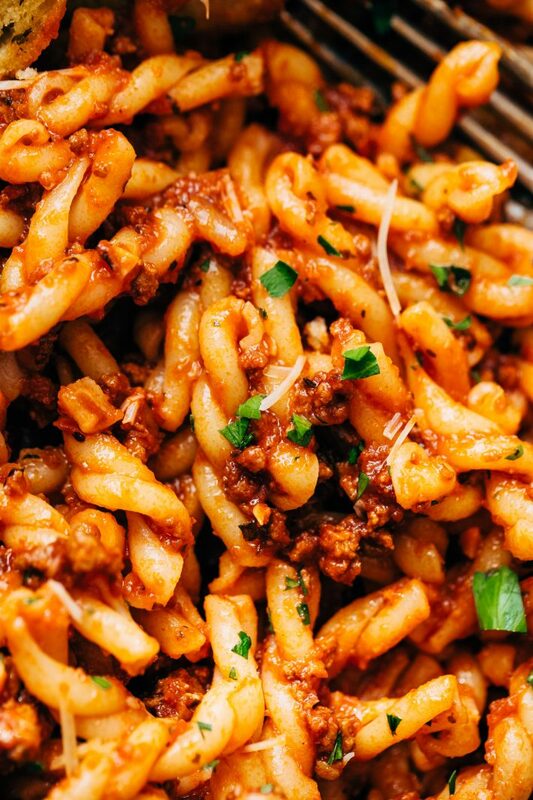 Make a big batch of this easy meat sauce. Have some now. Save some for later. Hearty, meaty and oh so satisfying! Optional (IP and stove top): Add the olive oil and the whole garlic cloves to a heavy bottom sauce pot or a dutch oven. Heat over low heat for 10 minutes and allow the garlic flavor to infuse into the oil, flipping as needed so the garlic doesn’t brown, remove and mince if you’d like to use it in the sauce or discard if you don’t want the garlic flavor. Stovetop: Add the ground beef to the pan and crumble and cook the beef over medium-high heat until it starts to brown. Remove all but a tablespoon of grease if you see it pooling. Add the chopped onions and continue to cook until the onions start to soften (about 8-10 minutes). Add the garlic, dried basil, nutmeg, fennel, and red pepper flakes during the last minute. Pour in the tomato puree, tomato paste, beef stock, and 1 cup water. Season with 2 teaspoons salt and the sugar if the sauce needs it. Bring the sauce to a simmer, lower the heat so it just barely bubbles and let cook for 3- 3 1/2 hours stirring every now and then. You may need to add a touch more water if the sauce thickens too much. I needed another 1/4 cup around the 1/2 way mark. Adjust seasonings to taste. Instant Pot: Saute the ground beef on the saute setting of the instant pot. Remove all but a tablespoon of grease if you see it pooling. Add the onions and allow them to cook until the onions start to soften (about 8-10 minutes). Add the garlic, dried basil, nutmeg, fennel, and red pepper flakes during the last minute. Pour in the tomato puree, tomato paste, beef stock, 1/2 cup water, and stir to combine. Season with 2 teaspoons salt and the sugar if the sauce needs it. Cover the instant pot with the lid, make sure the vent is sealed. Cook the sauce on manual high pressure for 15 minutes. You can do either a quick release or a natural pressure release. Adjust seasonings to taste. The sauce tastes even better as it sits. Feel free to make this ahead of time! Prepared meat sauce can be refrigerated for 4 days or frozen for up to 4 months. 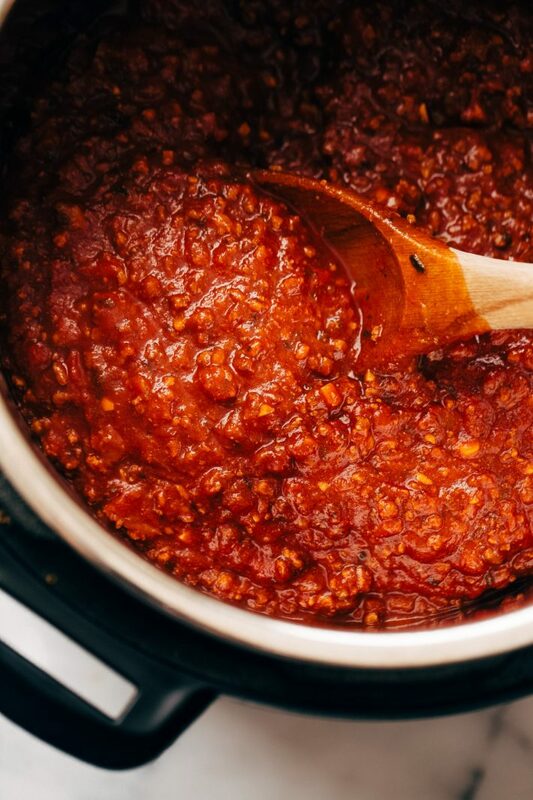 Sauce works great for stuffed shells, lasagna, spaghetti, zucchini boats, and so much more!